This amazing swimming pool will bring you years of fun with friends or family members in your backyard. 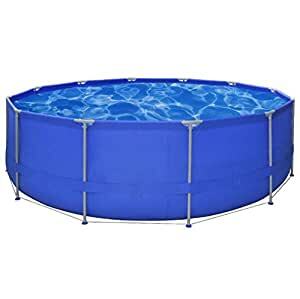 Made of durable 3-layer laminated material of heavy duty PVC with a polyester mesh, this stylish pool will hold a capacity up to 2707 gallons. The quality steel frames bring super stability and ensure the pool a long service life and excellent durability. The pool can be set up in a quick and easy way. Simply lay the paddling pool down on a flat surface, install the whole frame and then fill the pool with water. With the drain plug, the water can be discharged easily and quickly. This pool has 2 connections to connect a filter pump (not included) to it. Moreover, it’s easy to fold away for storage and transport when not in use. Delivery includes the swimming pool only.